It was about 9:30 last Friday evening when the event we drove four hours to attend wound down. Judah Smith, his family and a cohort of worship leaders from his church in Seattle had just finished the last stop in the "Jesus Is _____" tour. The night was spectacularly Spirit-filled, just as service had been on the two Sundays back in August when we were visiting our family out west. I joined the line that had formed off to the side, with the goal to make it into his post-event Instagram collage, let's be honest. In a perfect world, our families would have left the venue together, talked about God, Seattle-love, where one buys the skinniest jeans in the Pacific Northwest, I would swap tips with his wife on how to do life with an exclamation-mark-of-a-husband, attempt to put Judah's fantastic cackle into a bottle and then we would go home. But in Rochester, Real World, there I was, standing in an unreasonably long line with my children (two of whom were totally thinking about leaving and getting 20 more American McNuggets for $5), feeling this weird anxiety. One of the kids asked what we were doing and, well, I didn't know. I had just listened to this pastor hit it out of the park, painting portraits of God’s outrageous love for us, offering nuggets of wisdom I couldn’t not jot down. I had just heard truths about marriage, family and community. And I had just experienced this with my husband, my kids and some of my most darling friends at a newly-discovered thriving church. That exact question touches so many parts of my life. After a year off social media, I am struggling to manage my re-entry. Old habits are very slowly but unmistakably gnawing at my thumbs, luring me out of amazing moments. First mentally, offering me possibilities on how best to capture the scene unfolding in front of me, suggesting captions and making me believe that I’m a gifted photographer. Once I am suckered by that bait, the device comes out and I am clicking not once, but twice, you know, just in case the first one was blurry. And what could have been, should have been a private delight for my heart becomes public fodder, begging to be liked and liked and liked by people who weren’t there. Wasn’t the experience sacred enough to keep to myself? If something can be said in 3 words, I’ll use 8. I’m trying to paint a picture, okay? I’ve developed a bit of a reputation at the dinner table and with friends because of it. I. Want. To. Talk. And while I’m sure they’ll tell you it’s endearing, I am challenged in every conversation I have to be a good listener. The Holy Spirit works overtime nudging me to save my two cents for another time and give this moment to them. Because sometimes a friend just needs to be heard. Shouldn’t making that happen without agenda be enough? Part of the reason I got off social media was because it became a comparison trap for me. Posts became scrolling reminders of what I didn’t have, where I didn’t go, and what I don’t look like. Even without a screen in front of me, I am still learning to be wholly grateful and faithful over the few things God has put under my charge (Matthew 25:14-30). Why do I still need to assure myself that I have been made fearfully and wonderfully enough, that I am called to be exactly where I am, and that I have been equipped with enough to thrive in that exact place? We left the line and joined the rest of the gang in the café and soon after we headed out. The next morning at breakfast I witnessed my godson’s first taste of Nutella, we picked up a few US-only food items, and the kids each came home with their own road trip souvenirs (tour t-shirts and of course the 10 year old boy picked up Pokemon cards). 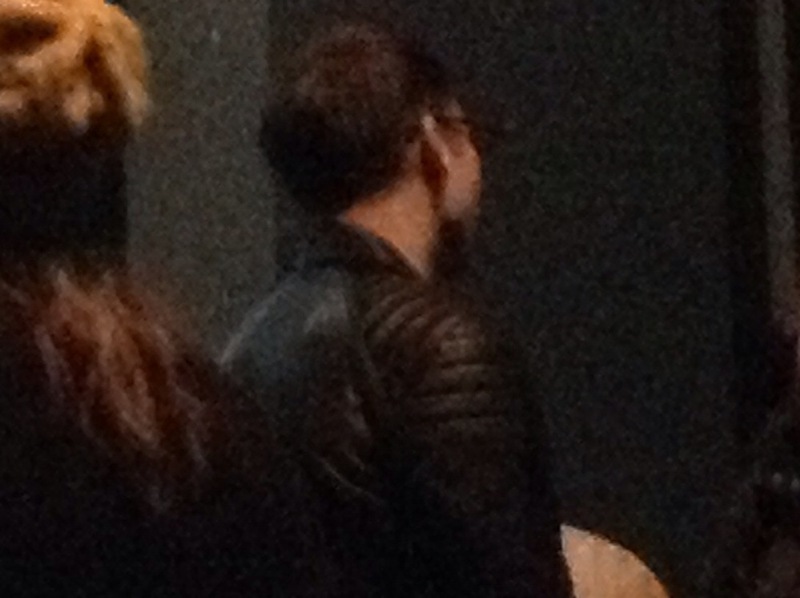 I came home with this horribly-taken picture of Judah Smith’s back, for my amusement, really. But I also came home with a full heart and a tank refilled to face the next leg of my journey that awaited me back across the border. And once I got home, I realized the answer to the question posed by this book, its tour, and all these little struggles in my heart. Jesus Is _________....enough.